Powerful vocals, charismatic laugh, earnest lyrics: an unpretentious songwriter who sings from the heart. 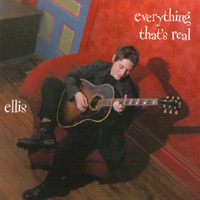 Everything That's Real is Ellis' third studio release, named one of the Top Ten Indie Releases of 2001 by Music Connection Magazine. The album was recorded at the Seedy Underbelly in Minneapolis entirely in analog format. The album was her first solo album that she recorded, after leaving her former band, Bobby Llama. Wanting to do something different, Ellis produced the record on her own and stuck with a pure analog format (no digital editing). Ellis was joined by Brian Roessler and Peter Anderson, adding bass and drums & percussion respectively. Ellis is a rising star on the folk music circuit, creating a buzz after being voted “Most Wanted to Return” and performing on the Falcon Ridge Folk Festival preview tour. This talented singer, songwriter and guitarist has since been invited back to several première listening rooms including Club Passim, Outpost in the Burbs, Caffe Lena, and P.A.C.E. She has also been asked to open for several established artists such as Patty Larkin, Richard Shindell, Cheryl Wheeler, and Todd Snider. Known for her vibrant and open-hearted nature and contagious sense of humor, Ellis’ music is described as joyful, unpretentious modern folk with a slight hint of country inspired by her southern roots. After moving from Texas to Minneapolis at age 16, Ellis got her start singing her own songs at open mics where she quickly dropped her often-mispronounced last name (Bergeron). She joined a rock band in high school while also setting up her own record label to put out her first solo CD Soft Day in 1996. She began touring full-time in 2000 and has independently sold more than 30,000 copies of her five CDs. Ellis started performing the women’s festival circuit in 2000, with regular performances at the Michigan Women’s Music Festival and recently headlined the National Women’s Music Festival in 2006. She has since made her debut at several folk festivals in 2007, including the Loyalist City Folk Festival (Canada), the Falcon Ridge Folk Festival, Telluride Bluegrass Festival, and the Rocky Mountain Folks Festival. Although she tours nationally more than 130 dates each year, she continues to retain a devoted following in Minneapolis where she was voted Best Musician for five consecutive years and named 2007 Best Musical Artist by readers of the Minnesota Women’s Press. She is also a favorite on college campuses, and students recently nominated her as 2006 Best Female Performer in Campus Activities Magazine. By turns sassy, tender and exuberant, this CD comes straight from the heart. Great accoustic music: no nonsense fabulous songs! I saw Ellis live and was blown away by it. This cd is very catchy, check it out. so glad i brought this cd..im singin outloud & lovin it!! not sure what the neighbours think tho :) !!! Only 2nd to Tigers Above, this is also an amazing disc, and I think that you should definately take the time to hear this one. The songwriting is beautiful, intense, and as always, moving. This disc is special to me in 2 ways, first I was propsed to during "Lovesong", and 2nd, the last (and fourth) time I saw Ellis live she played "The Phoenix", a song that I hadn't heard live before, and it moved me to tears. This disc is just a good reminder of what a beautiful person Ellis is, and how that beauty shines through her music. This CD is sweet and earnest, and inspiring. And Ellis is hot to boot.